The year 1943 would be the high water mark for Steyr-Daimler-Puch, what had begun the previous year would take its full measure during 1943. A combination of a vigorous modernization and expansion with a loosening of ordnance regulations (lessening standards of fit and finish and the introduction of simplifications) would come together to significantly improve the company armaments output. Truck production more than doubled again, ball bearings nearly so and small arms would all rise markedly, – this is as much a product of a settling of production as lessening of acceptance standards. The prior years often saw changes in production, the moving of shops to accommodate construction projects, the moving of machinery to different factories, to Radom, Letten and Graz, all this took a toll on productivity. It was also during March 1943 that SDP entered into a special agreement with the SS, the leasing of barracks and labor at KL Gusen for production of rifle components, which would be assembled and tested at the main factory at SDP-Steyr. This relationship was far more involved than it seems at first glance; SDP had been intimately involved with slave/coerced labor since 1941, mostly on construction projects and the operations in occupied Poland where the company involved itself in the exploitation of Jews and Polish civilian labor. This new SS contract was actually quite controversial at the time, the German Army and Armaments Ministry was very much against this program, as it would be beyond their authority and oversight, – and it would be largely funded by money provided by the military. Very little is known about the parameters of the program, although it was certainly outside the scope of military armaments production and the rifles were never intended for military purposes. This entry was posted in Kar.98k, Steyr Werke on March 11, 2018 by loewe1869. After enormous expenditures on modernization and expansion, production rationalization began to show its potential. The process of rationalizing production, where some items were eliminated and resources redirected towards more important items, is best illustrated by production totals during 1942, where truck production more than doubled and ball bearings nearly doubling. In armaments production, the results were less impressive, but most of the shortfalls were a result of external decision making; the changeover from the MG34 to MG42 production and unrealistic demands amidst modernization and rationalization efforts added confusion to an already stressed production line. Within the context of the demands placed upon the firm, the skilled labor shortage and the prioritization among competing projects (small arms were never a top priority) the trends were showing promise for 1943. This entry was posted in Kar.98k, Steyr Werke on May 2, 2017 by loewe1869. The subject of acceptance and proofing is the most important element of German military rifle research, almost everything relevant about a rifle under discussion comes down to these markings found on the rifle and various components. Although this is an indisputable fact, it is also indisputable that very few collectors fully appreciate the importance of acceptance in an evaluation. Even the distinction between the three terms is lost upon most collectors, who casually use “proof” for any marking found on a rifle. In view of this observation, the following will outline the differences and relative importance of the three general forms of markings that determine a rifles originality and ultimately value. This blog post will focus on the Imperial era, however a lengthy article is available that covers 1870-1945, which will feature in the Winter 2017 MRJ (Issue 214). This entry was posted in Gewehr98, Kaiserliche Marine on April 28, 2017 by loewe1869. 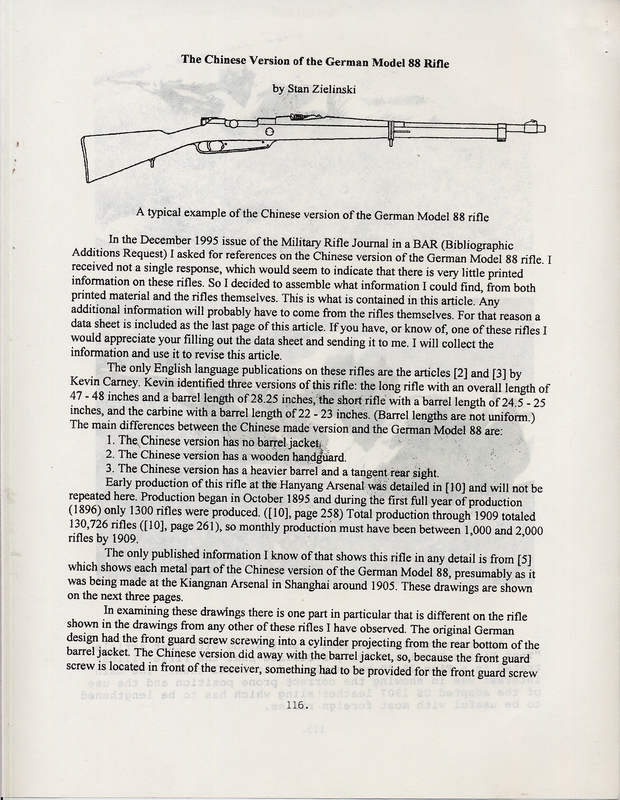 The article was in the May 1997 issue and is about the Chinese version of the German Gewehr 88 and it may very well be the only good information on the subject. Unfortunately, I do not have the master copy of this issue, so these pages are scanned from a regular copy. Back Issues are available. $7.00 for a full issue or $5.00 per article (PDF only). This entry was posted in China on October 22, 2016 by loewe1869. During late 1941 a series of events led the German military to introduce a number of measures that would create what collectors today call “dual code” rifles, – rifles that exhibit signs of two manufacturers involvement in a rifles manufacture. Here we will deal with rifles that were made by Berlin-Lübecker (ordnance code 237 or duv). These rifles draw considerable discussion among collectors, especially on the internet forums dedicated to the study of the Kar.98k. The rifle characteristics not only confuse who the maker is, but also when the rifle was made. Specifically, these rifles were made with Astrawerke receivers, identified by the lower case “L” on the right side of the receiver and very often marked with Gustloff-Werke, Weimar’s ordnance code “bcd” over “41”, which indicates the rifle was made in 1941. This alone causes considerable confusion with newer collectors, but what has baffled experienced collectors for years was when were these actually assembled? This entry was posted in BLM, Kar.98k on March 20, 2016 by loewe1869. Looking for the Best Deals, Coupons and Giveaways? Check out Bargnhtress for the best deals, coupons and giveaways! This entry was posted in Books, Links on December 19, 2015 by mrjblogress. The vast majority of “dual codes” Mauser-Berlin assembled were based upon Astrawerke made receivers coded “bcd”, which represents Gustloff-Werke’s operation at Weimar. They range in dates from 1941 through 1943, though all seem to have been made in 1942 and 1943. These receivers are far more complicated to date than the ERMA “dual codes”, which all fall in a narrow window of production. Apparently Mauser-Berlin took delivery of the first receivers very early in 1942, you see them showing up in the middle of the first block of 1942 production and increase in number through the early blocks of Mauser-Berlin production. Actually, this type of receiver represents the majority of rifles assembled in some blocks. It is far easier to find a bcd/ar 42 in the “b” through “g” blocks than a straight up ar/42 in those blocks. These seem to end in the 1942 g-block, at least for a time, only to show up again in smaller numbers in 1943. During 1943 the bcd/ar 43 dual codes are much rarer, but show up in almost every block between the a-block and j-block (they show up in the b-block through g-block, at least one is known in each block, plus one i-block is also known). Most interesting are the receivers that are not actually “dual” coded, there are several Mauser-Berlin assembled bcd/43 without the added “ar” in the last blocks, the g-block and i-block, which shows that they dispensed with this added feature near the end. The bcd/ar 42’s and bcd/ar 43’s are trickier to date, obviously, the 1943 dated were assembled in 1943, the barrel codes on enough of them prove this, but as the acceptance and serial patterns are nearly identical between 1942 and 1943 production, you really need to see the barrel code to know when a rifle was probably made. This entry was posted in Kar.98k, Mauser - Berlin, Mauser Oberndorf on July 8, 2015 by loewe1869. Recently, a question was raised about Mauser-Berlin’s production of the so called “dual coded” rifles, that began in late 1941 and ended in 1943, – the same year Mauser-Berlin dropped carbine (Kar.98k) production to focus on MG42 production. I thought this would be a good subject for discussion, so examination of known examples follow. It seems that Mauser-Berlin took delivery of leftover ERMA (ax code) receivers late in 1941, when they dropped rifle assembly to focus on MP40 production (They would continue making 98k receivers, though primarily as a sub-contractor for JP Sauer). The first rifles show up in the “L” block of 1941; however it is the “M” block when most show up, mostly late in the block and very near the end of 1941 production. They linger into the first block of 1942 production (no suffix). Most ax-ar coded rifles were probably made at the very end of Mauser-Berlin’s 1941 production run; though it is likely many were not finished until early 1942. This is because of the characteristics found on the known rifles. First, Mauser-Berlin production serialed both the receiver and the barrel until very late in 1941, typically this changed in the last block of Mauser-Berlin production, the m-block. In that block you will start to see the rationalization changes, ordered by Hitler and imposed upon the German military, to simplify production. 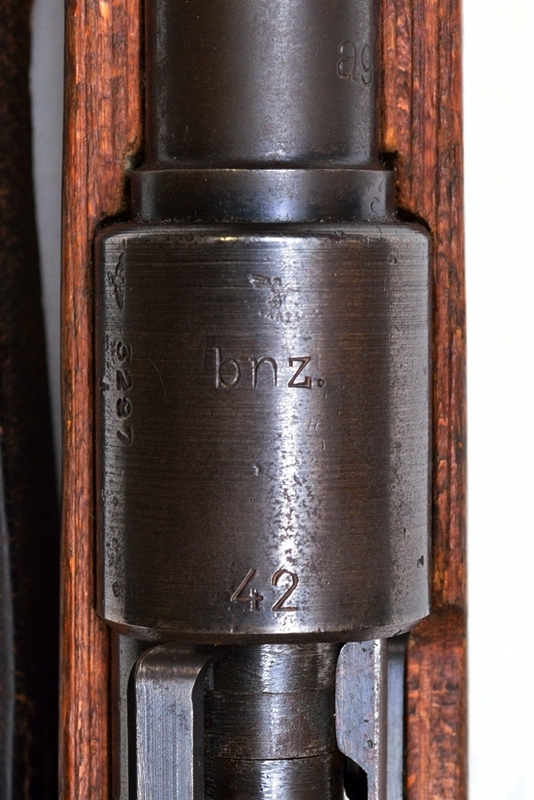 This process is best shown in rifle production with a reduction of markings and finish standards that you will see on late 1941 and throughout 1942 production, – it also accounts for the reason ERMA, and later Mauser-Berlin, would be redirected to other projects, and away from rifle production.